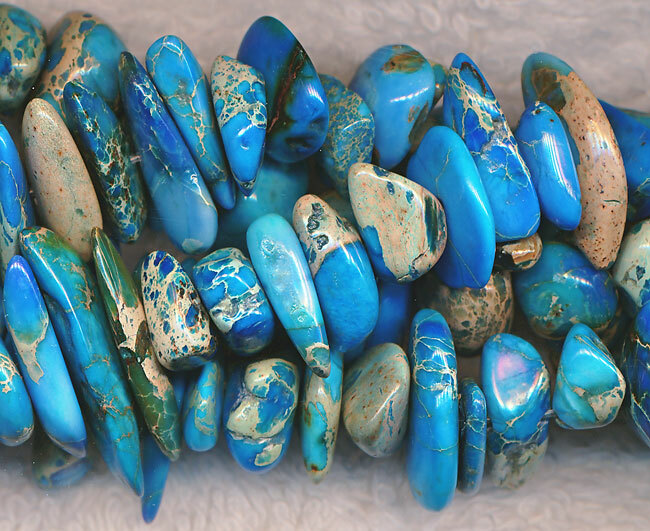 CLEARANCE Freeform Turquoise Blue Impression Jasper Chips - Size : Varies, Freeform avg 4mm x 14mm x 9mm - Hole : ~0.8mm - Count : avg 100+ beads per strand - Treatment : Dyed - Sold by Strand - 3 min. Sea Sediment Jasper Beads | African Impression Jasper Beads - African Impression Jasper and Sea Sediment Jasper are only two of the names for this gorgeous stone that is also referred to as : Spider Web Jasper, Imperial Jasper and Variscite. Jasper was a favorite gem in ancient times and is referenced in Hebrew, Assyrian and Latin literature. The name jasper comes from the Greek and means 'spotted stone'.